When it comes to further protection for your vehicle, car covers are an essential accessory you need to get. In this article, we’ll look into Covercraft car covers, Rain X and Budge car cover reviews. After all, each car cover is designed to provide excellent protection against numerous types of weather elements like UV rays from the sun and acid rain. It can even protect from seasonal attacks from snow and hail. Not to mention that it can also defend your car from common pollutants like dirt, dust, mildew and seasonal weather problems caused by both snow and hail. See, car covers really are essential! 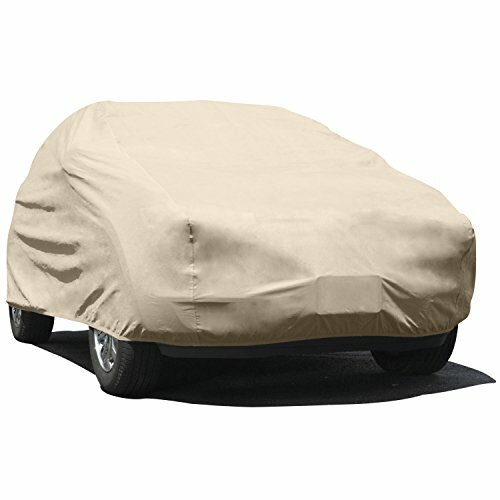 Where to buy car covers? When it comes to fitted car covers, you may want to check out Covercraft. It’s a brand well-known for its best outdoor car covers as well as indoors. They are more known for their custom-patterned covers (not much for their universal car cover line, though). They also make semi-custom covers, or what some may call ready-fit. This custom-made cover is created with all-weather fabric made from polypropylene fibers. They are bonded in such a way that all 4-layers of the cover are highly durable. It can protect from droppings, tree sap, and other industrial pollutants. 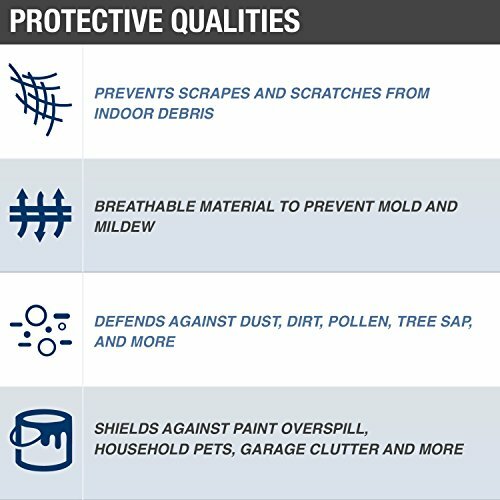 It can also defend your paint from unwanted nicks, dings, dents, and scratches. Another excellent feature that comes with this cover is that it has a filtration barrier that keeps away many airborne pollutants. Plus, the fabric is breathable, so you don’t need to worry about moisture and heat. It also has very tight bottom-edge elastic for a perfect fit. The four-year warranty from Covercraft also makes this an excellent investment. 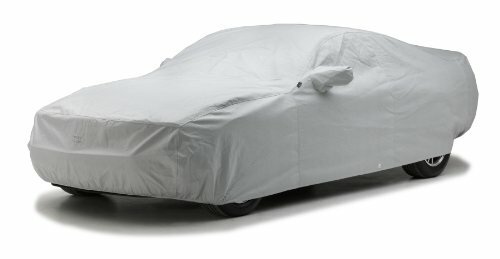 If you’re looking for a car cover that offers general protection, this is the one for you. It is made with 3 layers of durable fabric. You’ll be getting a product that can perform well in water resistance, breathability, and softness. Plus, it’s custom-made to fit all of your car’s beautiful curves. Its fantastic film barrier features microscopic holes that are small enough to release moisture but not large enough for water droplets or dust to pass through. Aside from giving you protection from heat and moisture, this cover also weighs significantly less than the NOAH fabric at 3.2 ounces. It is also created with bottom-edge elastics for a more secure hold as well as sturdy grommets for a cable lock. Practical and convenient, it also has an amazing three-year warranty. Last on the list but definitely not least, is another excellent all-weather cover. It is also made from four layers of non-woven polypropylene fibers. This cover can provide intense defense from the damages caused by UV rays. It also does a fantastic job of protecting against droppings, tree sap, and many more. Of course, it boasts of a highly effective filtration barrier that locks out dust and water as well as allowing moisture and heat to escape. This cover also has Bi-component Technology that allows the fabric to have a soft feeling to keep your finish and paint safe. This Covercraft cover is also made with a bottom-edge elastic that keeps it securely in place and even has grommets so that you can attach cable locks. You can get all these and still feel secure with the four-year warranty that comes with it. Whether you’re looking for a cloth car cover or a canvas car cover, Covercraft can offer you something since they come in many different fabrics. Each line has their strengths and weaknesses. Complete info can be found here. 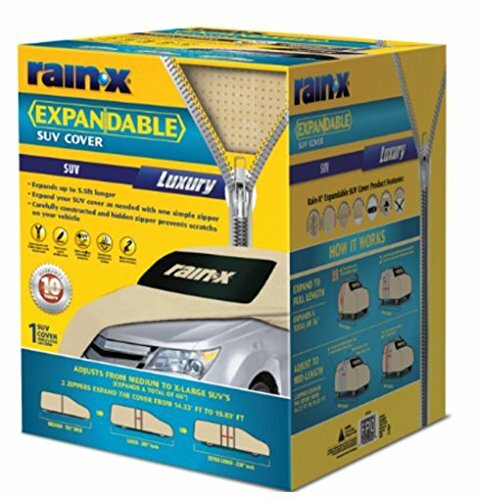 When it comes to its own type of vehicle protection, Rain X isn’t famous for its automobile covers. They’re more known for its glass cleaning agents. However, they also produce a line of fabric covers. Yet, they do not have plastic car covers on their catalog. Since they’re not famous for this line, they only produce a handful of products. They are also suitable for both outdoor cover and indoor cover use. Check out their car covers over at Amazon, and read car cover reviews from customers. You might find the one for you! 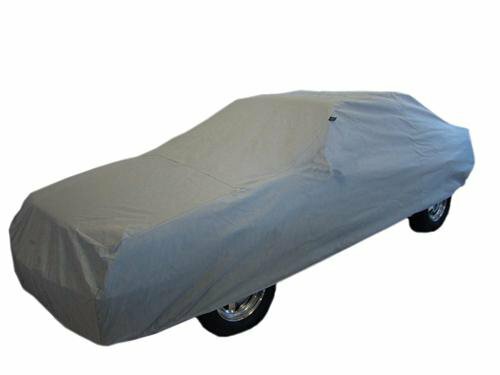 Budge Industries prides itself as the pioneers of the original car cover. They’ve been in the business since the 1940s. With that kind of history, you know you’re in good hands. After all, they know all about the benefits of a car cover. Since then, they have expanded their company and has made numerous lines for both cars and trucks. Plus, they’re highly respected in the industry. Go over to Amazon and read Budge car cover reviews. Maybe they have what you’re looking for in a cover. Automobile covers are one of the easiest auto accessories to buy. They are even available at different price points. You can buy car covers at most auto shops in your local area. You can also avail them in-store like Walmart in their Automotive section. But nowadays with online shopping, you can purchase vehicle covers at online stores like Amazon and Autozone. Best of all, they provide benefits like free shipping, discount and more! Some brands, especially those specializing in custom car covers, also have their own websites so you can go check those out as well. If you are looking for a custom-made cover for your car, read this Custom Car Covers article to find out the best place to get one made. Short answer, yes, automobile covers do work. But their performance can also depend on different factors. When choosing a car cover, you should determine whether it’s appropriate for your local weather. If you’re in a place that experiences a lot of storms, a waterproof car cover will be a good choice. If you live somewhere that gets cold in the winter, a snow-proof cover would be beneficial. That’s not to mention the other benefits you can get from covers. It can also help protect your paint from basic problems like scratching and oxidation. Additionally, automobile covers also provide better protection from theft. 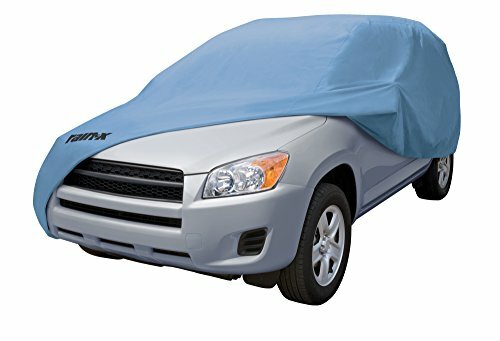 The best car covers for outdoor storage and indoor storage will also have unique pros. Outdoor ones will be more durable against natural and industrial pollutants like tree sap and dirt. Indoor ones would concentrate more on dust, mold, mildew, and the like. All you have to do is look for the cover that works best for you and your vehicle. If you want to learn about the more weather specialized types of cover, head on over to these articles – Hail Protection Cover and Car Cover for Snow. Also, if you want to learn more about the particular kinds of automobile covers you can get for your vehicle to enhance its defense, head on over to this article – Car Window Covers and Car Dashboard Covers. As a passionate outdoorsman and an automobile enthusiast, James spent most of his time in his garage tinkering with cars and bikes. During his free time, he loves to hike and blog about the things that he has done to keep his ride in tip-top condition.